What an awesome background to go with the stunning quilt. Your machine quilting is fabulous, and good luck in the festival! You did an amazing work! A beautiful quilt and a truly lovely story. Thanks for sharing. 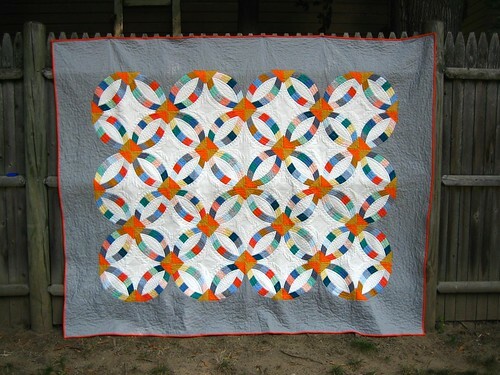 I love how you chose to quilt this – lots of variety and texture that complements the piecing. Fabulous! 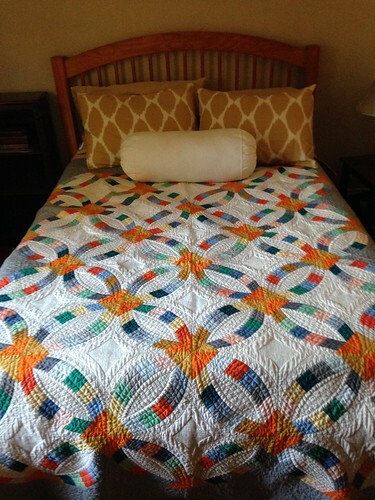 It’s a gorgeous quilt, and a wonderful story to go with it! What a beautiful quilt!! I love your fabric choices and the quilting is wonderful!! Wow! 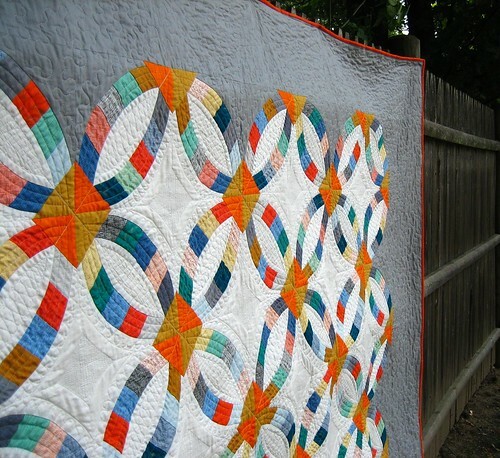 This quilt is gorgeous….and well deserving of some Quilt Festival love. Having just made a Metro Rings (quick curve ruler as well), but not having quilted it yet, I was excited to see your quilting for inspiration. And I’m inspired! Not to do it on my home machine tho…I’m just not that patient…courageous. Your colors make this really fresh & modern. What a lovely gift, I hope your friends know how special they are to you! So much work! Love the story that goes with this quilt! Great job on the quilting. The peicing was simpler using the Curved ruler. It just looks harder. What a beautiful quilt! The contrast between the colours/white/grey and the red binding is perfect. A wonderful story and a wonderful, wonderful present. Lucky girl! I am in awe of anyone who can quilt that size of quilt on a domestic. I love the added texture your quilting gives and the way it complements the piecing. coming over from the blogger’s quilt festival. Love love LOVE your quilt and the beautiful story to go with it! Such a beautiful quilt! 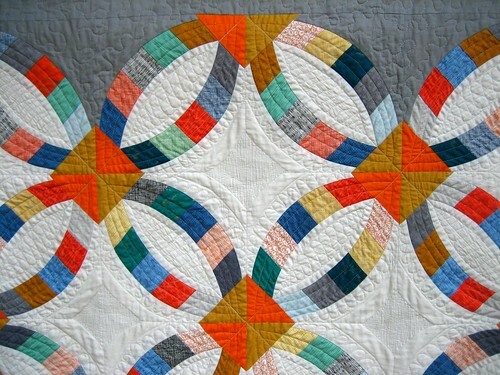 And I love the echoed diamond in the quilting in the centre of each ring! Got to love a wedding ring quilt! Lots of lovely quilting going on in there! I really love the way you quilted this! It not only emphasizes the DWR design but showcases the wonderful colors you used for the ring connectors. Add to that the touching story of why you made it and for who, makes it that much more special!